CEGSIC (Center for Geophysical Studies of Ice and Climate) is a research group based in the Physics Department at St. Olaf College. Our main goal is to understand the response of the world's ice masses to global change. More specifically, we utilize the tools of ice-penetrating radar and satellite imagery to study the dynamics and evolution of glaciers and ice sheets in various parts of the world. 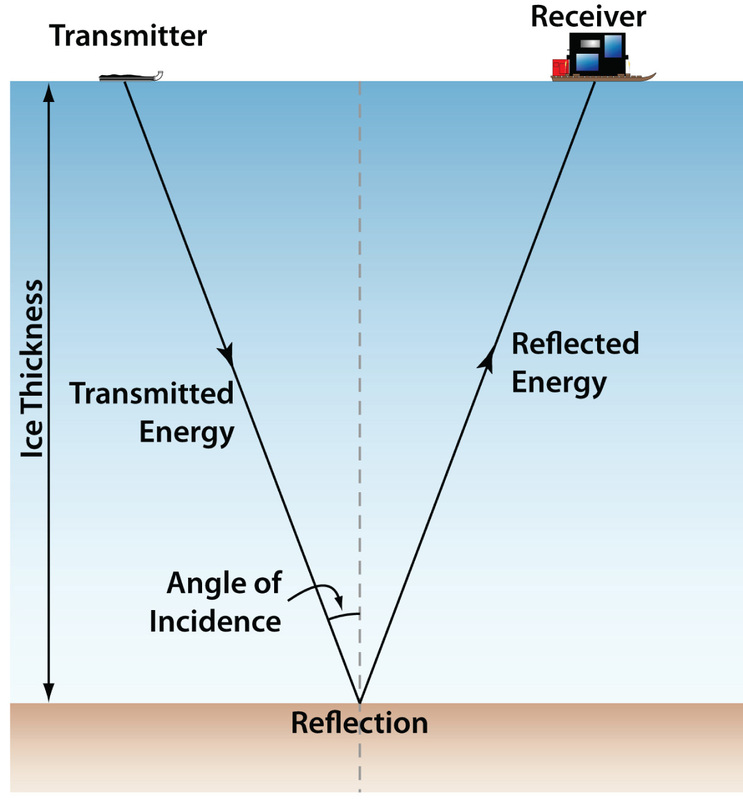 Ice radar is a remote sensing technique analogous to sonar in water, except it works with electromagnetic waves instead of acoustical waves. Echoes return from the ice/bedrock interface, from water and air pockets, and also from volcanic debris layers which depict how the ice deforms as it flows. This process is demonstated in the image to the right. Satellite remote sensing is a complementary technique that gives information about surface topography and ice motion. CEGSIC has been involved in a number of different projects over its history ranging from glacier studies in the Washington Cascades, Sweden, New Zealand and Greenland to multi-intstitution collaborations in Antarctica. These projects have sent Dr. Bob Jacobel and other faculty to Antarctica multiple times. Other projects have provided field experience for undergraduates in Sweden, Alaska, and the Cascades. Our support comes from the National Science Foundation's Office of Polar Programs and the National Aeronautics and Space Administration. Currently, CEGSIC is part of the Whillans Ice Stream Subglacial Acess Research Drilling project (WISSARD) in West Antarctica. WISSARD is a six-year project involving nine institutions across the country. The goals are to better understand ice sheet dynamics by studying the hydrology of a subglacial lake and its drainage to the ocean, to drill through the ice to access the lake and the ocean at a grounding line site, and finally to conduct the first-ever scientific study of the biological systems at these two subglacial environments. Our primary task is to utilize geophysical techniques to characterize the lake and grounding line environments prior to drilling.